Nomadic Pop-Up Post Office Shop - now you see it, now you don't, and guess what's inside ? Royal Mail are delighted to be working with Post Office Ltd on their Christmas Stamp Shop. This Pop Up Post Office is a large mobile trailer that will tour some of the major shopping locations around the UK in the run up to Christmas. §§ Well, so much for official information sources. If this is a foretaste of what we can expect now that Royal Mail and Post Office Ltd are split, and external contractors are involved, the future looks to be full of confusion. 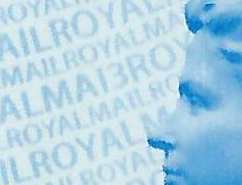 After the original MA13 report was countered by Royal Mail, yesterday evening I received a report that the MA13 2nd class Faststamps had indeed been purchased at Newcastle on day 1, for a brief period. Evidence from eBay and another blog shows that MA12 stock was loaded in both machines initially but that MA13 stock was loaded part-way through the morning of 20 November (Day 1). I delayed reporting this initially because I wanted to find out whether the stamps were available from both machines and whether our representative on the road had was able to secure any for our customers. (My initial thought was that he might not have made the journey when the 'no MA13' correction was made.) I now believe that we may be able to secure some and make some FDCs for our customers. More news to those customers later. I've been told that only 2 rolls (of 1500 labels) were available. But that does not mean that there may be more later depending on usage - by Shepherds Bush who knows what might be available. MINT NOW IN STOCK ON OUR WEBSHOP - FDCs now in! UPDATE 26 NOV: An pair of stamps listed on eBay bought at Glasgow on Sunday morning (24th) is reported to have MA13 code, and we have since had reliable information that MA12 was available on Saturday, but MA13 was on sale on Sunday. Both MA12 and MA13 were available at Liverpool. Click on the 'receipt' image to see a larger version. Thanks to several contributors for this information. Glasgow: 23 November both machines had MA12 2nd class. 24th November MA13 loaded and session numbers 2536(A3) and 2569(A4) obtained. 5th December: Machine A3 had MA13 Robins and MA13 2nd class and A4 had MA13 Robins and MA12 2nd class. After 2pm - the 2nd class roll MA13 was now sitting in A4 and A3 was holding the MA12. The system was in use by the public but not in any quantity and used mainly for an individual value e.g. a Christmas card to Canada or a letter to Hong Kong. Sales push was with the Smilers and as these were ordered through the machine each sale would be logged and go on the final total figure so even though there might have been 40 transactions it would include the Smiler requests. "The first of its kind to be found in the UK is located in Camden Market and is showcasing a range of collectible and retail items. The Pop Up shop will be open seven days a week and customers will benefit from extensive opening hours as well as a range of services including posting and packaging. To help make life easier for customers a gift wrapping service is also available with all donations going to BBC Children in Need." I haven't had a formal statement from Post Office Ltd about the rationale behind the tour, but understand that the focus is on selling stamps - expect there to be blow-ups of the competition winners designs - and instant Smilers. There will be no counter services, no Horizon system, though there may be a posting box, presumably with mail to be offloaded into the local mail distribution system. So although they are described as post offices, they are really just post office retail units. There is no doubt that - despite initial difficulties in actually finding it - customers made the Camden unit a great success. The new mobile trailers - to be located in major shopping streets or covered shopping centres - will stand out. It seems they won't be tucked away in an otherwise vacant corner. But can the same sort of success be replicated when the unit is only in one place for two days? By chance the Camden unit's turnover included significant philatelic sales as collectors and dealers found definitive stamps not previously available from Royal Mail's Tallents House bureau or from many post office branches, and further supplies were made available as collectors bought up initial stocks. Philatelic sales will be far lower (pro rata) at these venues than at Camden last year, although collectors will certainly flock to Newcastle on 20th November for the new 2nd class Machin Faststamps with year code MA13 simply because it will be available for the first time. But one has to question why it exists, given that stocks of the MA12 version were sold only at Spring Stampex and in bureau packs and have never appeared in Post Office Wincor-Nixdorf machines. I'm not one for using the term 'cynical exploitation' but I feel sure that the original print run of MA12 2nd class Machin Faststamps has not been exhausted. Some pictures from our readers - many thanks Doug, ! There will be some who want labels from each venue, though two sites in Newcastle over 2 days is a bit excessive. But a Welsh or bilingual receipt for Cardiff, maybe one in scots for Glasgow? would break up the monotony of what is becoming rather repetitive. The Newcastle venue involves a switch of the same SINGLE 'Stamp Van' between Northumberland Street North (20/11) to Northumberland Street South (21/11). I would say unlikely as the existing Welsh P&G machines dont have a bilingual option (well the one in Aberystwyth doesn't and I would say Welsh is spoken more there than in the south where the other three are located) but never say never, if there are two machines then perhaps we could have Welsh/Gaelic overprints on the stamps too, or would that be against regulations? 1st Large/1st Braisg or Mawr? I believe the Horizon system issues bilingual receipts? I've just been advised by the seller that the 2nd/2nd Large on offer are MA12! It's the 27th - where are you Stuart ??? 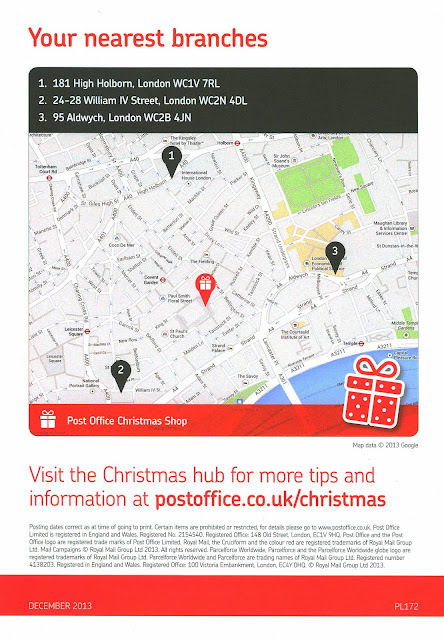 From Post Office, via twitter: they are open until 7pm, but only from 11am, so no need to rush in the morning! Thanks for asking, I'l add the info to the blog post. Went to Cardiff on Saturday 7th. Machine A3 had MA13 Robins on Reel A and MA13 2nd Class Machins on Reel B. Machine A4 had MA13 Robins on Reel A and MA12 2nd Class Machins on Reel B. The shop is looks like its designed to travel to shows /events/exhibitions and provide a PO presence. However apart from the guy manning the machines (who was extremely helpfull and knowledgeable) the rest of the operation consisted of lots of PR girls whose main focus was to grab and picture you with their I-Pads inside the van and then encourage you to buy a sheet of smilers with said picture. They noticeably glazed over when I asked them which machine the MA113 2nd class machins were in before the chap mentioned previously came to the rescue!!!. Interestingly there was no post box available which surprised me, there was just a signpost pointing you to the nearest one which was 100m away. If anyone from the PO reads this, great idea, location in Cardiff could have been better as most of the Xmas shoppers there (and there were a lot) were in the St Davids shopping Centre on Saturday and many would have by-passed St Mary Street! Why was the West Country ignored on this tour, a couple of days in Exeter would have been good! Visited Croydon Pop up Shop this morning. Receipt A3 misprinted Westpick Shopping Centre soon corrected to Whitgift Shopping Centre .